By ignoring the democratic regression, Washington is sending dangerous signals to the rest of the region. Things are going in reverse in Thailand, one of the longest standing and most important U.S. allies in Asia. This nation of sixty-six million has been a major non-NATO ally since 1961. However, the military junta has now impeached a democratically elected prime minister, Yingluck Shinawatra, on corruption charges in an attempt to justify its power grab in the May 2014 coup, thus preventing this popular prime minister and sister of former Prime Minister Thaksin Shinawatra, himself removed in a military coup while he was in the U.S. in 2006, from shaping the future of this vital Southeast Asian nation. Under a state of emergency that is still in effect, the parliament, stacked by the military junta after the elected body was dissolved, has impeached the prime minister so as to criminalize what would be seen by most observers as a misguided populist policy. This is akin to impeaching a U.S. president over an ethanol subsidy, pork barrel spending, or a dairy program, all to justify the removal of a democratically elected government. The junta and it’s rubber stamp parliament also moved on Yingluck, the first female prime minister in Thailand’s history, to prevent her and the Phou Thai Party from engaging in domestic political life, as according to current Thai law, impeachment carries with it a ban from politics. But the junta is attempting to impeach the prime minister for a policy it continued once in power. The elite in Bangkok have held sway in Thai politics for most of the kingdom’s history. 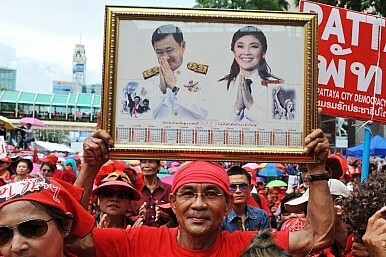 This political dominance was upended by Thaksin Shinawatra and his Pho Thai Party, with their appeal to everyday Thais. The Bangkok elite, unable to effectively counter this popularity have lost every election since 2001. Rather than working on policies that might expand their popularity, it has used a series of maneuvers, from the ridiculous to the violent, to unseat the elected government. From removing a prime minister for appearing on a pre-recorded cooking show to annulling an election clearly won by the Phou Thai party, the institutions of government in Thailand – the military, the privy council, and the constitutional court – have been used not to protect the rights of the people, but to overrule their clear wishes as expressed through election outcomes. The Obama administration has correctly emphasized the importance of Asia. The Asia pivot or rebalance is the clearest strategic concept to come out of the administration. However, if the pivot is not to be regarded as a failure, similar to the Russia reset, more must be done to address the situation in Thailand. In the days following the coup, the State Department said the right things. However, as little serious attention was being paid to Thailand, given more deadly events elsewhere, the junta saw that it paid no price for continued repression. To demonstrate the value the Obama administration places in Asia and the principle of one-man-one-vote, the junta leaders should receive an asset freeze and visa ban, a tool the administration has used everywhere from Hungary, a NATO ally, to Venezuela. The absence of any U.S. response to the rollback of liberty and democracy in Thailand sends the wrong message to Myanmar; which President Barack Obama and former Secretary of State Hillary Clinton have visited and on which they pin much of their hope as a legacy foreign policy success. Military rule in Thailand could also have repercussions for the new democratically elected leaders in Malaysia and Indonesia. They may find themselves more susceptible to pressures from their military or Beijing, convinced that Washington will stay on the sidelines. It will also make progress with the TPP difficult. Congress and the American people will not want to link U.S. markets more closely to a country experiencing marshal law, military rule, a shrinking economy, and instability. Those who would argue that stronger action simply throws Bangkok into Beijing’s lap missed that the junta leader met first with a Burmese general praising the coup and Chinese businesses stating interest in working with the new military order. It also fails to recognize the recent example of Hanoi and Naypyidaw who, feeling the squeeze of Beijing, have reached out to the United States for greater insulation from China’s grasp. The military junta in Thailand first promised that an election would be held in 2015 but it has since reneged and seems prepared to stay in power much longer, not allowing elections again until after the royal succession, when all those associated with Thaksin and the Pho Thai party are prevented from participating and the Bangkok elite is assured of victory. The Obama administration should push for the State of Emergency to be lifted and elections to be held in 2015, with full participation of all parties and political leaders. Until this commitment is guaranteed, the administration should not appoint an ambassador to Bangkok and withhold agreement on a replacement for the recently departed Thai ambassador. The Pentagon should carefully review its interactions with the Thai military to ensure that important missions such as emergency relief and counter terrorism can go forward without the military junta using this cooperation as an endorsement. And those most responsible for the denial of democracy in Thailand should receive an asset freeze and travel ban by the Treasury Department’s Office of Foreign Asset Control. In abandoning its democratic ideals, the country risks a return to a pre-modern era. ‘New’ Rice Scheme Reveals Thailand Junta’s Dearth of IdeasThe Rice and Fall of Yingluck ShinawatraThailand’s Rice Scheme Post-MortemThailand’s Crisis and the 1932 RevolutionIs Time Running Out for Thailand’s Elusive Election?